We are committed to helping you clear your AWS DVA-C01 Certification exam. You can easily pass AWS Certified Developer - Associate using our online preparation platform which provides DVA-C01 practice exam. Our team of experts has designed this practice exam based on their 10+ years of experience in the Developer domain and expertise in AWS Technology. We have carefully maintained weights of AWS-CDA syllabus topics, exam pattern, timed exam environment, and scoring system same as the actual AWS Developer Associate (DVA-C01) exam. Our experts have included practical and scenario-based questions in AWS-CDA practice exam; such questions are the most frequently asked in the actual DVA-C01 Certification exam. We believe in "The More You Use, The More Confidence You Gain", please try our sample AWS DVA-C01 practice exam to build the trust. All the questions covered in the sample AWS Developer Associate simulation exam are basic AWS DVA-C01 Certification exam questions. However, we strongly recommend practicing with our premium AWS-CDA practice exam, because you may get more practical and real time scenario based questions in your actual AWS DVA-C01 Certification exam. Our premium practice exams are comprehensive in terms of Developer. Below are the advantages and features of Premium Practice Exam Membership. 350+ Practical and Real Time Scenario Based AWS DVA-C01 Certification Questions similar to the actual AWS-CDA exam questions with correct answers for assessment. 2 Months Unlimited Access to online AWS Developer Associate certification practice exam. Multiple Choice Questions to be answered within the Specified Time Limit. Questions are updated regularly to align with the latest syllabus topics and certification test pattern. Personalized Result Book to track your progress and Result History for quick reference. Price is just $26.90 USD, lowest compared to other AWS DVA-C01 material. 100% Money Back Guarantee if you couldn't pass the actual exam in first attempt. We have a dedicated team of AWS certified experts who are having more than 10 years of experience in Developer technology. Our structured and autonomous review system collects feedback and exam experience from recently certified candidates, based on those inputs our domain experts regularly update AWS-CDA test questions for practice. Our online premium practice exam is a simulation of actual AWS Certified Developer - Associate exam which allows you to test yourself with timed exam environment. We offer an unlimited attempt to practice with our online full/mini practice exam. Each exam attempt fetches questions from premium DVA-C01 question bank which contains 350+ most probable questions prepared by our domain experts. Every time you will face questions in random order with shuffled multiple choice answer options to make your exam experience more challenging. You can review your past results and check performance history of your past attempts. Such facilities are the significant advancement over DVA-C01 question set in PDF and far better than fraud dumps sites. According to our survey with AWS certified candidates, you can easily score 85% in real AWS Certified Developer - Associate certification, if you are able to score 100% in the online premium practice exam. 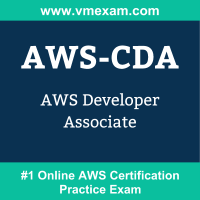 Passing the AWS DVA-C01 Certification Exam with a good percentage boosts your career and provides an opportunity to get a dream AWS Developer Associate Jobs with higher AWS-CDA salary. The review system is superb! Autonomous and structured review system of the DVA-C01 mock tests is quite great i must say. It helps in reviewing the practice plus i got to practice on the latest for the purpose of passing the AWS-CDA certification exam. The DVA-C01 mock tests have a big bag of practice questions. The best thing about these question bank is that new questions are updated on a regular basis from inputs from recently certified candidates. I cleared AWS-CDA exam.